This is the first blog post by my buddy Nathan Oyler, and I am honored that I got to host this. Nathan is an Enterprise Architect at SAP, and works in Oliver Bussman’s organization . He specializes in Hana. I met Nathan on twitter last year, and we have been friends since. We both enjoy Indian food, and technology – and hence most of our techie chats are done at our favorite Indian Restaurant, Chutneys, at Tempe, AZ. Teched 2012 was the first Teched I’ve attended, and it was as an SAP Employee working at the SAP runs SAP booth. SAP runs SAP is a project developed by our CIO Oliver Bussmann to ensure that SAP is always a first customer of products that we create. I work as an enterprise architect at SAP running the internal implementations of ERP on HANA, CRM on HANA, HANA as a side by side accelerator, and many other internal projects. I spent several months preparing innovative demos to present at Teched. I approached each customer the same way asking what they were interested in before considering whether showing the demos fulfilled their needs. What I learned quickly was that customers loved the story of SAP runs SAP, and were very pleased to hear about the different systems we run internally, but it didn’t fit their immediate concerns. Innovative demos are nice, but they wanted real advice on how to implement BW on HANA today in their current environment. I was blown away, and decided to do the only rational thing. I became an architect for each customer that visited our booth. I asked each customer about their environment to understand what sort of challenges they experience. I listened intently before I spoke and tailored everything I said to the direct specifics of their situation. It couldn’t have went better. Over and over again I worked hard to consider ideas from the customers as if I was an architect working for them. There were configurations I had never even considered before. There were older versions of our products that I didn’t know customers ran! It was fascinating hearing about their challenges and considering options to improve their situations. And they listened. The fact that it was IT talking to them as opposed to a sales guy really made a difference in my opinion. I wasn’t trying to sell them on anything, but really made an honest effort to determine what I would do. In some cases I even suggested holding off on HANA, and instead focusing on other topics that were very specific to their business. Most of the time I thought BW on HANA was the right fit, and helped many customers make improved business cases for themselves. 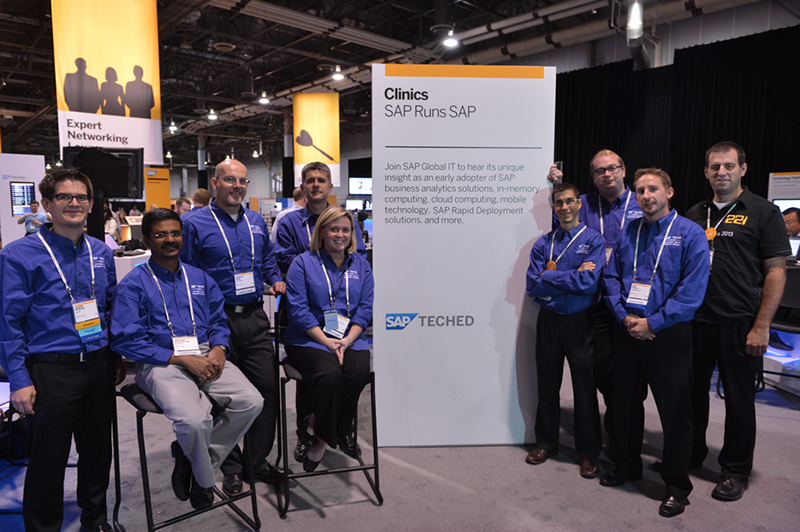 It was tremendously difficult to deal with the range of questions people had, and there is no way I could have done it without the teammates at the SAP runs SAP booth, Dirk Pluschke, David Poisson, Oguzhan Genis, Bjoern Brencher, Martin Lang, Paul Rostagno, and Eileen Butler. They allowed me to roam a bit while providing wonderful Demos on Business Objects, SAP applications for Windows 8, Mobile Applications designed by SAP IT, and providing many talks as well. It was a tremendous effort from everyone, and I’m really proud of SAP IT being a leader in helping shape customer decisions. Overall I thought this year’s Teched was a huge success. Many of our customers came into it unsure if HANA was right for them, and walked away with a clear understanding of the choices, rewards, and challenges related to upgrading to BW on HANA. Several customers were looking for a HANA Architect to employ in their company, which shows the demand for HANA, and the need for skilled architects to help these customers add HANA into their environments. My job may have been to give innovative demos, however when a customer gives me a compelling challenge like that, I have to react. As we know, the customer is always right. Next Can Enterprise Software Innovation Be Industrialized ? Nothing speaks better than the real story.